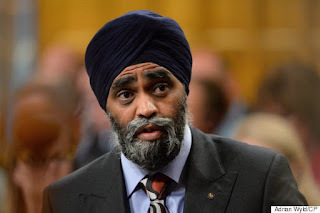 The Canadian press is reporting that there is “Some Baloney” in the statement by Defence Minister Harjit Sajjan that "In 2025, the CF-18s will not be able to fly, and it is important that we move very quickly in filling this capability gap." It is hard to know just where to start when faced with a report like this. At least part of the conclusion of “some baloney” that the Canadian Press has come to is based on a statement by “the commander of the Air Force” who recently told a House of Commons committee that when present commitments are taken into account, the number of planes they need is 65. The fact that the much heralded baloney meter didn’t even quiver at this idea can’t help but make one question the accuracy of the CP baloney meter. Apparently we are to believe that a country of some 36 million people, with a land mass of 3.885 million square miles, or 9.985 million square kilometers if you prefer, the 2nd largest country by land mass, after Russia, in the world, can be adequately defended by a force of 65 jet fighters. The CP article goes on to point out that the now opposition Conservatives claim there's no capability shortfall, because upgrades could keep the planes flying until 2025. Again the Baloney Meter doesn’t seem to register the fact that that it is the people on whose watch this apparent shortfall came about who are claiming that there is no problem. It was the Conservative plan to extend the lifespan of the CF-18s until 2025. Of course this doesn't mean new planes won't be required until then. There's a transition period, so the first new plane would have to arrive in 2020. Alan Williams, a former assistant deputy minister for materiel at the Department of National Defence, is reporting as saying that gives the government ample time to run an open competition. Again, apparently not even a flicker on the Baloney Meter at the suggestion that Canada’s procurement system has the capability to run a competition, which would include all the terms and conditions of the acquisition of the selected aircraft, as well as beginning to take delivery, in under four years. The truth is that the airframe life of our limited supply of aging fighters is becoming harder and harder to manage. Involvement in assorted bombing campaigns doubles or even triples the wear and tear on the rapidly declining resource that constitutes our CF-18 fleet. Yes, at great price, these aircraft can be kept airworthy, although in some cases airworthy really means “fit for training only”. The question is, are we just throwing good money after bad? If that is the case, then our capability gap becomes a very real thing. What some observers find disconcerting is that this possible acquisition is being contemplated in isolation from the current defence review. It can be argued that the defence review should consider what Canada wishes to do in the world in relation to future security issues and that equipment would be acquired based on that analysis. That would be the preferred option. But the truth is that there is a growing capability gap and that at present our standard procurement practices are not capable dealing with it. A sole source purchase of interim fighters, in this case Super Hornets, is a perfectly reasonable way to deal with the problem and if approached properly it should not overly constrain any future acquisitions. Of course , we could always check that on the Baloney Meter.